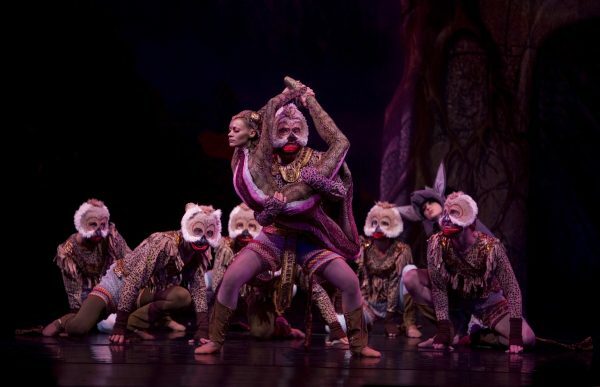 State Street Ballet returns to Northern Arizona University this spring with an original telling of Rudyard Kipling’s timeless tale,“The Jungle Book.” The choreography of State Street Ballet founder and artistic director Rodney Gustafson and original score by Czech composer and conductor Milan Svoboda bring the characters of the jungle to life, taking audiences on a journey through the jungles and forests of India. “The Jungle Book” performance takes place at 4 p.m. March 10 in Ardrey Memorial Auditorium. Tickets for “The Jungle Book” range from $5-$35 depending on seat location with discounts available for groups, seniors, children and students. Further details on ticket prices and availability can be obtained from the NAU Central Ticket Office in the University Union, online at the CTO website or by calling (928) 523-5661 (ordering charges may apply). The Northern Arizona University Undergraduate Symposium showcases the creative discoveries, in-depth research and scholarly work of students from various colleges and disciplines. More than 1,000 students participate in the event, sharing hundreds of posters and presentations with thousands of peers, professors and community members in attendance. This year’s Undergraduate Symposium will be held 9 a.m. to 4 p.m. April 26 in the University Union/Fieldhouse. Student presenters range in disciplines from environmental engineering to art education, such as last year’s Ziyan Wu, who used computer modeling to help engineers divert and control rainfall that needs to be accommodated as it frequently changes patterns and Karla Arteaga Cortes, whose research focused on creating free spaces in the classroom for counterhegemonic actions to introduce social justice as a part of classroom discussion. A common feeling among all participants is the value of doing hands-on research as an undergraduate and how the experience will influence their future educational and professional careers. The Undergraduate Symposium is an opportunity to support the accomplishments of students who have dedicated months and sometimes years of time and labor into their projects. It also is a chance to get an inside look at innovative ideas in a variety of fields. Engaging in discussions and asking questions provides invaluable experience to first-time presenters. Anyone interested in attending the symposium may volunteer to be a judge at one of the sessions. No experience or NAU affiliation is required. Visit the registration portal to sign up. Oral presentations will be scheduled in two sessions. Times and lengths of oral presentations are determined by schedules for specific rooms. The Undergraduate Symposium events are free and open to the public. For more information, visit the event website. Benjamin Koch, research associate at the Center for Ecosystem Science and Society, was featured in the online publication Fatherly. In “How to Cook Chicken That Won’t Make Your Kids Sick,” Koch writes as a father and scientist on the dangers of antibiotic-resistant bacteria in raw meat and tips on how to prepare meals safely. Physics and astronomy professor David Trilling co-authored a white paper on Large Synoptic Survey Telescope (LSST) cadence. “Enabling Deep All-Sky Searches of Outer Solar System Objects” contributes to LSST’s goal of mapping the solar system small body populations to better understand its formation and evolution. Minor Endowed Professor Pete Fulé in the School of Forestry collaborated with visiting scholar Louise Fuchs and Museum of Northern Arizona representative Larry Stevens to publish a study in the journal Forest Ecology and Management. “Dendrochronological assessment of springs effects on ponderosa pine growth, Arizona, USA” uses tree-ring analysis to highlight that ponderosa pines growing close to small springs in the forest had consistently higher growth and less sensitivity to drought compared to similar trees located farther away, showing that springs may play a crucial role in buffering the effects of climate change on nearby trees. Northern Arizona University’s Transfer and Online Connections collaborated with Off Campus Partners to launch Louie’s List, an off-campus housing resource designed to meet the needs of students, faculty and staff. Louie’s List simplifies the process of property rental for tenants, managers and owners by collecting important, relevant information in one user-friendly place. This new web-based service provides students with a searchable database for finding off-campus housing in Flagstaff and provides area owners and managers with a tool to market their properties to the NAU community directly from the university website. Through Louie’s List, users can select filters for specific searches, including price and location. Additionally, Louie’s List provides housing options for sabbatical or short-term renting, as well as a roommate finder. Those looking for a place to live can create a custom list of properties matching their preferences and compare listings with photos, floor plans, detailed descriptions and proximity to campus. Direct links are available to a property’s email, application or lease and website. Owners and managers listing a property choose their target audiences, such as graduate students or faculty and staff. The website also includes educational components designed to help students become good citizens of the Flagstaff community with resources aimed at living off campus for the first time, promoting harmonious relationships between the people renting out a property and the people living in it. The services on Louie’s List are free to students, parents, faculty and staff at NAU. Property managers and owners pay a fee to post listings. To list a property for rent or sale on the site, contact Michael Buckley at Off Campus Partners by calling (877) 895-1234. To visit Louie’s List, go to https://louieslist.nau.edu/.